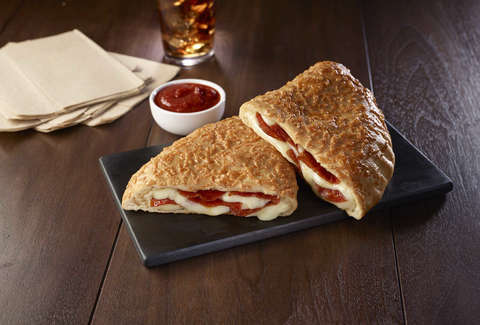 The P’Zone -- Pizza Hut’s version of a calzone -- is back. Ben Wyatt is more excited about this revelation than he was about the Cones of Dunshire, and I am too. Though Pizza Hut is doing a bit of a song and dance I’ve seen before (ahem, McDonald’s always touting the limited availability of McRibs), I’m more than happy to board this nostalgia train that takes me back to when P’Zones first launched, 17 years ago. The three new -- or should I say relaunched -- P’Zone flavors are pepperoni (self-explanatory), meaty (which contains all the meats: pepperoni, ham, beef, pork, and Italian sausage), and supremo (Italian sausage, green peppers, and red onion with cheese). The return of the P’Zone coincides with March Madness, which makes sense because Pizza Hut is official and only pizza sponsor of the NCAA tournament and also because, for some reason, people really need to carbo-load for the long weeks of watching other people play basketball. To see if she’s right, we had to investigate firsthand. I set out to try the rereleased P’Zones to see if they evoked the same joy they did for me when I was eight, especially with their new price point of $5 (when P’Zones were first re-released back in 2008, they cost $6.99, according to reporting by Food Beast). Here are my findings, ranked in order from my least favorite to the best one (there’s only three, but still). If sausage, onions, and green peppers are your jam, you’ll definitely love Pizza Hut’s Supremo P’Zone. It’s subtly sweet from the onions and peppers but still has some salty bite from the Italian sausage. Of the three P’Zones, this was my least favorite -- mostly because I feel about green peppers the way North Carolina fans feel about Duke; they’re not my fav. But it was still yummy (especially the baked parmesan cheese on top). So maybe not 100% in line with the whole North Carolina-Duke analogy. The pepperoni P’Zone is stuffed with pepperoni (duh) and cheese, with crunchy parmesan cheese baked on top. It’s not as filled as the other P’Zones, so it feels a little flat in comparison. That doesn’t detract from how good it tastes though. It’s like your favorite frozen pizza pocket snack, but way better because it didn’t come out of your microwave and is oozing cheese. The marinara sauce that comes with is a bit sweet, but balances out nicely with the saltiness of the pepperoni. Meat lovers rejoice! The meaty P’Zone has it all: ham, Italian sausage, pepperoni, beef, and pork, all layered with melty cheese. Of the three P’Zones, this one was definitely the most filled and the heartiest. You might be thinking, “But, Kat -- isn’t that too much meat?” to which I’d let you know that there is no such thing. It was next level savory and delicious to the end. It didn’t even need the marinara sauce; it felt complete on its own. If you love meat, this is the P’Zone for you. Pizza Hut’s relaunch of the P’Zones met my expectations and more. I have to be honest -- I was skeptical that Pizza Hut’s versions of calzones would live up to the nostalgic fantasy of them I’ve concocted in my head, but they went beyond that. The pizza dough was soft and well-baked, the fillings were evenly distributed and cheesy, and the baked parmesan was the cherry on top of all my calzone dreams. All three were like oversized empanadas of joy, and I’m almost certain Ben Wyatt would approve. Kat Thompson is a staff food writer at Thrillist who really wants to play The Cones of Dunshire. For more Parks & Recreation references, follow her on Twitter @katthompsonn.